The West Coast of the United States and Canada bring us the two women who comprise this Winning Spins. Pianist, composer and Californian Lisa Hilton and Canadian bassist and singer Brandi Disterheft, have forged careers as leaders and soloists on instruments found in the rhythm section. While Lisa has led quartets and quintets on recent recordings, her latest is a solo piano effort. Brandi, now a Harlem resident, enlists two veterans of the Big Apple scene for her new trio album. Blue Canvas, Brandi Disterheft (Justin Time), is the latest from a performer who has become part of a burgeoning number of female bassists who also sing, like Esperanza Spaulding, Nicki Parrott and Mimi Jones. As a bassist, Brandi distinguishes herself with one of the most booming, resonantly full tones on the jazz scene today. It is so strong she is confident enough to lead a trio here with one of the most assertive, two-fisted veteran pianists in New York, Harold Mabern. Rounding out the trio is the pianist’s frequent sideman, drummer Joe Farnsworth. Brandi includes her lyrics to three songs in the CD folder, but only chooses to sing on two. She reveals a clear, bright voice capable of sultry innuendo on the exotic “Crippling Thrill” and coyly pert on the jump-swing title track. While her singing is more than fine, it is only a momentary diversion on this album, essentially a terrific trio date with constantly engaging tunes and solos from all three participants. As leader, Brandi takes more than the usual complement of bass solos, without dulling the results. Her funky, reverberant solo follows and compliments Harold’s spirited rendering of and soloing on “Dis Here.” “Prelude to the Crippling Thrill” is two and a half minutes of compelling a cappella pizzicato bass. Brandi plays the lead, also pizzicato, on three tracks: “Willow Weep for Me,” Tadd Dameron’s “Our Delight” and, on cello, on her own “When the Mood is Right.” Harold conjures his inner Erroll Garner on a unexpected ballad version of Clifford Brown’s “Daahoud,” Brandi soloing with impressive double-stops. The pianist and drummer are front and center on Harold’s “Beehive,” a round-robin theme bouncing between bass and drums. And don’t miss “George’s Dilemma,” a lesser-known Clifford Brown tune revived rewardingly here. 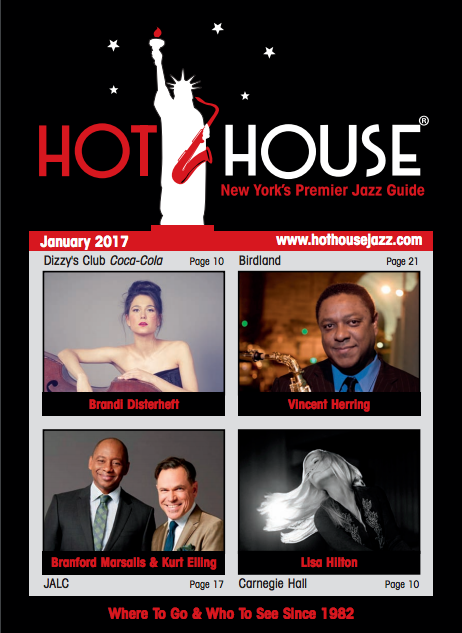 Brandi Disterheft has a CD release gig for Blue Canvas at Dizzy’s Club Coca-Cola on Jan. 3.